When you have a generator in place at your business, you are setting yourself up with a great alternative if the power should go off. But when that outage or major storm happens, your generator could be taking on a lot of work, running all day and all night until the problem is fixed. To prepare for these occasions, it’s important that your unit stays in good shape with these generator maintenance tips – even if you have not used it for a while. The first major check you will want to make on a regular basis is whether or not your generator is clean. It should be clear of leaves and grass, or anything else that might be swept onto it by the wind. There should not be anything on top of it – whether permanently, or even for a few moments. Make sure you check the air flow vents and the radiator in particular. It’s important to check your generator regularly, but even more so when the weather report begins to suggest a storm or a heat wave. When winds pick up, debris can block those air flow vents and cause overheating. There are some other checks that you should be doing regularly, too. These include monitoring the fluid levels, such as your oil, fuel, coolant, and lubricants. Set up a schedule so that the employee or employees who are responsible for the generator need to sign off on all of these checks once a week. You should check the battery charging rate, and ensure that the electrolyte level is correct on serviceable batteries. If your batteries aren’t working, you could be in trouble next time you need the generator. Visual inspections also need to be done across all of the fuel lines and connections. You should be looking for leaks in the lines, kinks, and loose connections, which need to be repaired or replaced as soon as possible. You should also make sure your generator still runs on a regular basis. To be safe, once a month, this should be added to your scheduled checks. Turn the generator on and make sure all of the indicator lights and gauges work properly. Ensure that the system is doing the weekly exercise tests that it has been set up to complete. Make sure to check the natural gas or propane pressure, oil pressure, frequency, temperature, and fuel pressure, comparing it alongside the specifications in your user manual. If they don’t match up, something is wrong. You can also check the voltage to ensure your generator has the right output. If you see anything at all during your checks which does not look right, call in maintenance for help. Any of these flaws could stop it from working properly when you do need it. When your generator does end up running and the power comes back on you shouldn’t just let it run and leave it alone. This is the time when checks and inspections are most important. You still need to keep things in good shape. After it has been running for eight hours, change the oil and the filters to ensure everything is still working fine. Once you have done that, your user manual will tell you how often your particular generator needs to be exercised. It’s important to check your generator regularly and to keep it in good working shape for when it needs to kick in. You will be rewarded with smooth running and no disruption to your power, which may be essential to keeping your business running. In addition, make sure to have regular maintenance visits and services from trained professionals who know how to spot the more complex problems. This will ensure your generator works in the event of a power emergency. 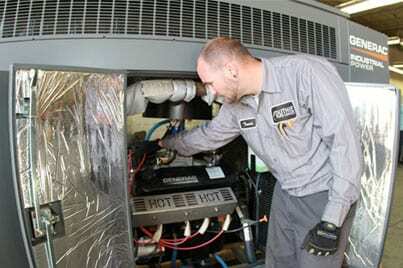 For more generator maintenance tips, request a quote or maintenance schedule by clicking here https://duthiepower.com/request-a-quote or give us a call at 1-800-899-3931.